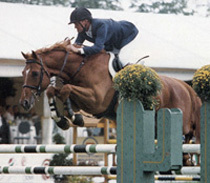 Exceptional Hunter-Jumper Registered North American Sportpony. Holsteiner and Section B Welsh cross. Premium pick at inspection. 4-year-old bay gelding, 14hh, very handsome, great attitude and manners. Does courses and flying lead changes. Champion prospect. Located in San Juan Capistrano, CA. DVD available. See him on You Tube.